Synchronise inventory across all online and bricks and mortar stores to dramatically reduce the risk of ever running out of stock. The Kooomo digital commerce platform automatically synchronises stock with its online inventory management, giving users real-time updates every 15 minutes. This dramatically reduces the chances of products going out-of-stock, and can also trigger a waitlist to appear on specific product pages as soon as an item is no longer available. Your existing online Warehouse Management System (WMS) can easily be integrated with the Kooomo platform, without the risk of losing any valuable data. All warehouse stock, as well as inventory in physical store can also be synchronised, regardless of location, offering customers a true omnichannel experience. 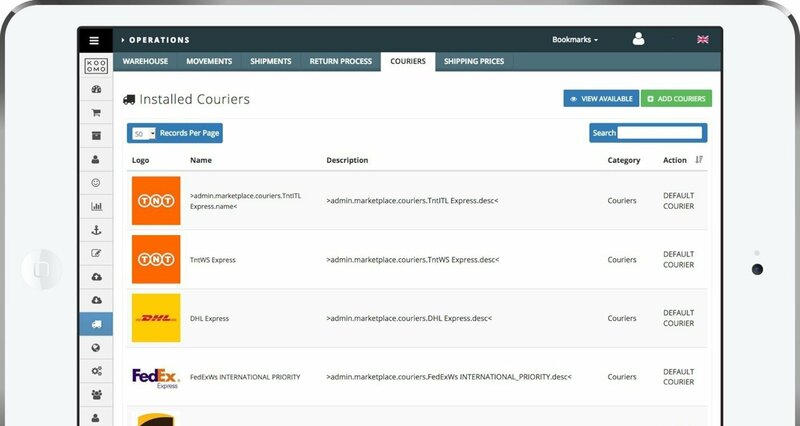 The platform is integrated with all international couriers, and our unique shipping algorithm automatically assigns the optimum shipping method for customers. Our partnership with industry aggregators, such as Scurri give brands access to over 20 couriers worldwide. Through the Kooomo platform, users also have access to PVS, one of the world's largest logistics networks.